HONOLULU — The state Department of Commerce and Consumer Affairs (DCCA) Business Registration Division (BREG) warns local businesses and the public about unofficial solicitations being sent out by Workplace Compliance Services regarding annual business report filings. 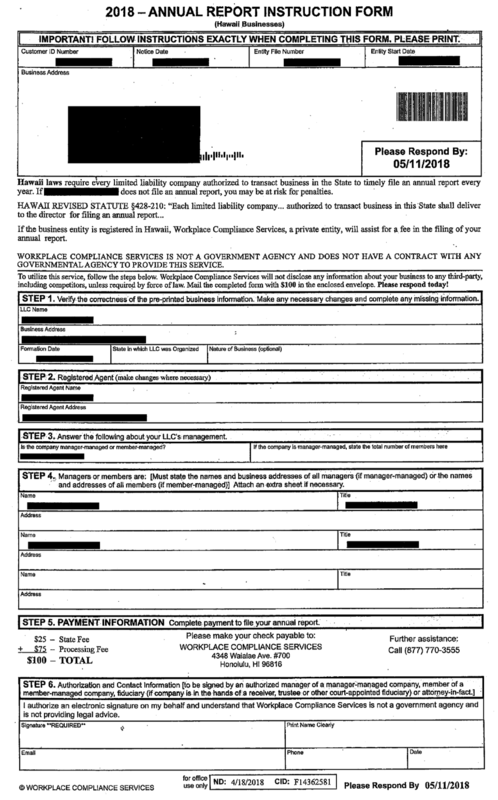 Workplace Compliance Services has been sending mailings labeled “2018 – Annual Report Instruction Form (Hawaii Businesses)” to numerous businesses in Hawaii, with instructions to fill out the form and submit it, along with a $100 payment (see image file below). “We’re alerting people of this solicitation because we are extremely concerned that they could be misled by it and erroneously believe that it comes from a state agency. On the contrary, Workplace Compliance Services is not a government agency, has no affiliation with one, and appears to use a mail drop as its company address”, said Ty Nohara, Hawaii Commissioner of Securities. The company is not registered with DCCA to conduct business in the State. BREG does not endorse or utilize the services of Workplace Compliance Services or any other third-party company to collect or file annual business reports. If you are ever unsure about the legitimacy of a notice you receive regarding your business filings, we encourage you to email breg@dcca.hawaii.gov or call (808) 586-2727 before responding to the notice. All businesses registered in the State can file their annual reports directly online in the quarter that it is due. To look up your business’ annual report information online, visit: http://hbe.ehawaii.gov/annuals. For filing-related questions, please visit www.businessregistrations.com, email breg@dcca.hawaii.gov, or call (808) 586-2727.